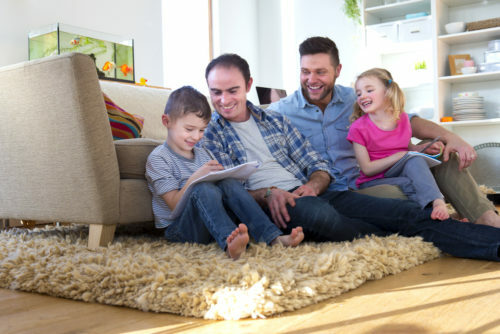 Even though gay fathers have risen in both numbers and visibility over the last decade, two thirds of gay dads and their children are still facing social stigma — with most of that social stigma happening in religious settings. “Among fathers who identified with a particular religion, the likelihood of having experienced stigma in a religious context was directly associated with the tolerance ranking of the religious group with which they affiliated; greater tolerance was associated with a lower probability of having experienced active stigma,” reads the study. Outside of religious gatherings and the like, a quarter of those said that social stigma stemmed from their families, neighbors, or other LGBTQ friends. Another quarter pointed to service providers, such as wait staff and sales clerks, as a source of social stigma in their lives. One surprising place where social stigma was not largely seen by these fathers was at the schools of their children, as well as in health care situations. Many also pointed to LGBTQ protections in their states for reducing the number and type of incidents. The paper, “Barriers and Stigma Experienced by Gay Fathers and Their Children,” details the responses of 732 gay men in 47 states. In it, researchers asked how the men became fathers, what sorts of barriers had they faces, and if they or their children had faced stigma in social situation. An overall 1,300 children are parented by the men in the study, with the children being an average age of 13 years old. The survey also found that gay fathers having children from a heterosexual relationship has dramatically dropped over the last two decades: 70% of those who became fathers prior to 1996 had become dads during a heterosexual relationship, compared to less than 6% after 2010. Meanwhile numbers are surging for those becoming fathers due to foster parenting, adoption, and especially surrogacy. “Adoption and surrogacy, two routes dependent on systems supporting the formation of families, have been increasingly common in recent years and in states with more legal protections, whereas heterosexual relationships were more common in earlier years and in states with fewer protections, reads the study.